Evil is stirring in Mordor. Its heard its master’s call. 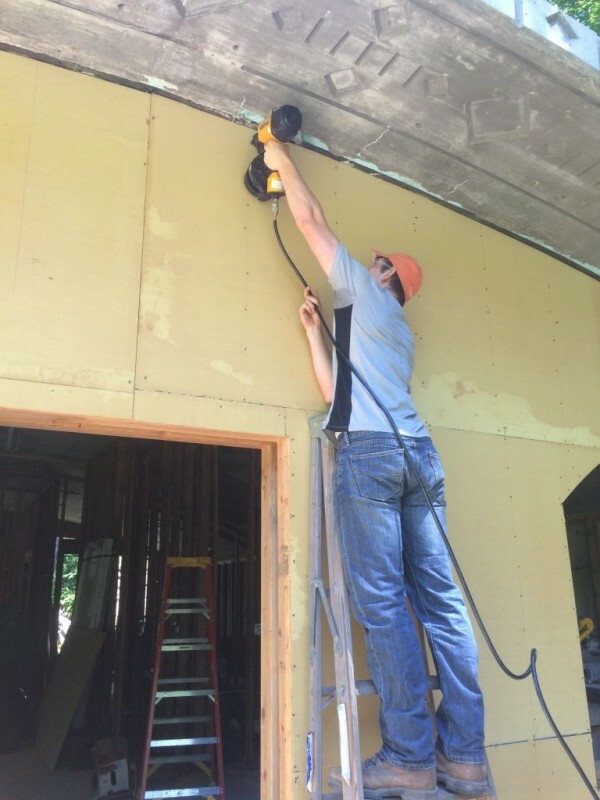 ….and welcome to another edition of the Hobbit Hollow Construction Blog! Glad to have the summer back. It hasn’t been too warm here up by me so it’s been kinda nice. Upper 70’s, low 80’s for the most part so it has been really pleasant. What hasn’t been so pleasant is the state of my pool. It’s like a bad horror movie. It’s almost as if I’m waiting for a dead body to be pulled from it’s stinking green bottom. Then you would hear the pool store guy say something like, “I knew it wasn’t the chlorine! The chlorine levels were off the charts!! !” Then in the movie version I assault the pool store guy and go to jail. That’s sort of where we are as far as the state of my pool is concerned. You know…..me assaulting a pool store guy. It’s not really funny though. So I’ve been super busy at work (Who isn’t busy these days Jim?). So in my laziness I’ve really been thinking that all we have to do to fix the pool is go to the pool store drop-off a water sample and move on. A failed strategy this year. (Okay Jim let’s have the short version everybody’s getting bored.) The pool technician came out on Friday to check the filter and some other stuff. Yep the filter is shot. Like not working at all shot. It figures. I kind of thought that something might be wrong about two weeks ago but was hoping that in the next week it would start getting better. Does anything ever get better when you just hope it does??? It never seems to work that way. At least that has been my experience. The new filter is coming on Tuesday. I hope? The only saving grace is that it really hasn’t been pool weather yet. Of course this week it will get into the upper 80’s. I mean the pool is so disgusting you can’t even go out to sit around the pool and enjoy the outside. It’s embarrassing. I hope for the pool guy’s sake this filter comes in and it works quickly. Okay it’s not that good but it does kind of tie the start of the blog together into the whole pool thing pretty well wouldn’t you say? Hmmm. I have to make a personal apology to Sally H. for not replying to her comments a few blog posts ago. Forgive me Radagast the Brown. I’m sorry. It won’t happen again…..and I think you would have a fighting chance against a gorilla. We went to a Mexican restaurant Saturday to celebrate my niece Shea’s 21st birthday. It was fun. I had the shrimp fajita. It was really good. I didn’t eat the floured tortilla thing though. You know the flat bread thing that you put the food into and wrap it all up in nice and neat. I over stuffed myself with the chips, salsa, and guacamole appetizers. So at the end of the meal that mother in law of mine, who unfortunately is sitting across the table from me, says, “Ya gonna eat those tortillas?” No I’m not. So I give her the tortillas. Then she proceeds to start counting the tortillas like I’m not giving her all of my tortillas. What’s up with that???? Like I’m keeping a tortilla from her. Like I’m hiding one from her in my shoe or something. Then she says, “They only gave me two and you got three.” Yeah, right. This little old lady is like an eating machine. She didn’t even realize that she double wrapped her first tortilla. She actually slapped my hand away from the salsa when it started to get low. That’s what I’m up against here people. Let’s get back into the world of construction again shall we? I had a little help this weekend from Terence and Georgia which was really great. They helped out a lot. I put Terence to work nailing off the sheathing on the front side of the house with a nail gun. Georgia on the other hand went to work on clean up patrol. Which was actually quite a big job in and of itself. 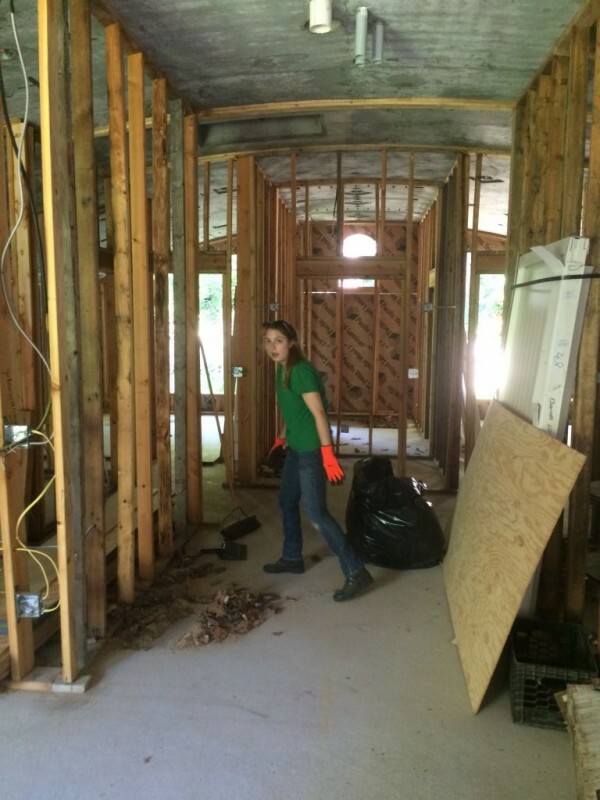 Job sites get so messy so fast. Here they are having at it. Terence nailing off the sheathing. georgia cleaning up the mess. So the framing details for the windows is a bit different in a Passive House than on a typical run of the mill house. 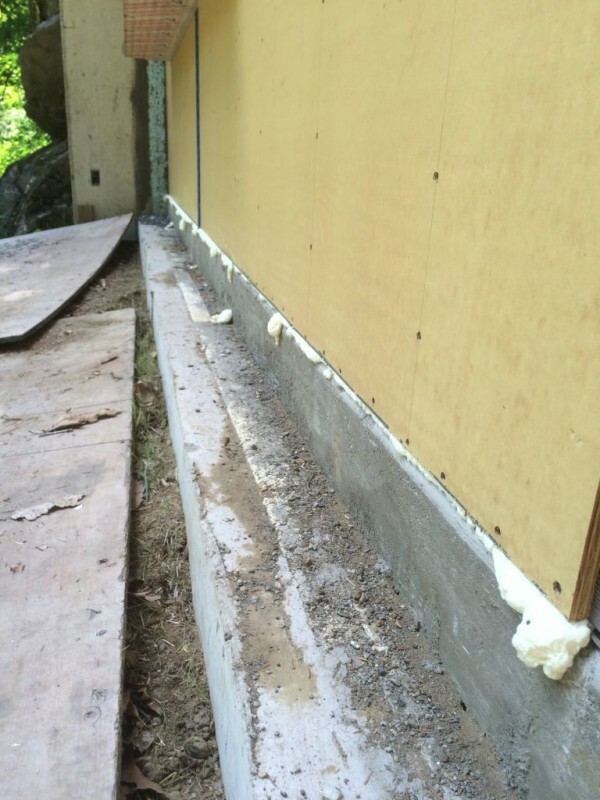 What we are going to do is add 4 inches of styrofoam to the outside of the house on top of the exterior sheathing. This, when combined with our interior insulation, will yield an exterior wall R value of about 58. R-38 on the interior and R-20 on the exterior side of the sheathing. Okay, so this doesn’t mean a lot to most of you but trust me this isn’t done on 99.9% of homes now. So what we have to do is extend the window framing beyond the wall frame so it will receive this exterior styrofoam. 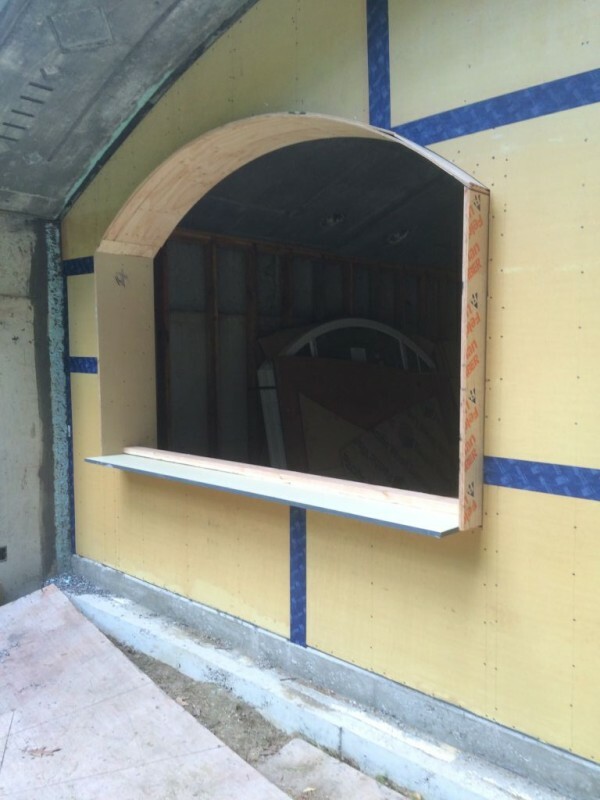 The tricky part being the arched curve over the front windows. 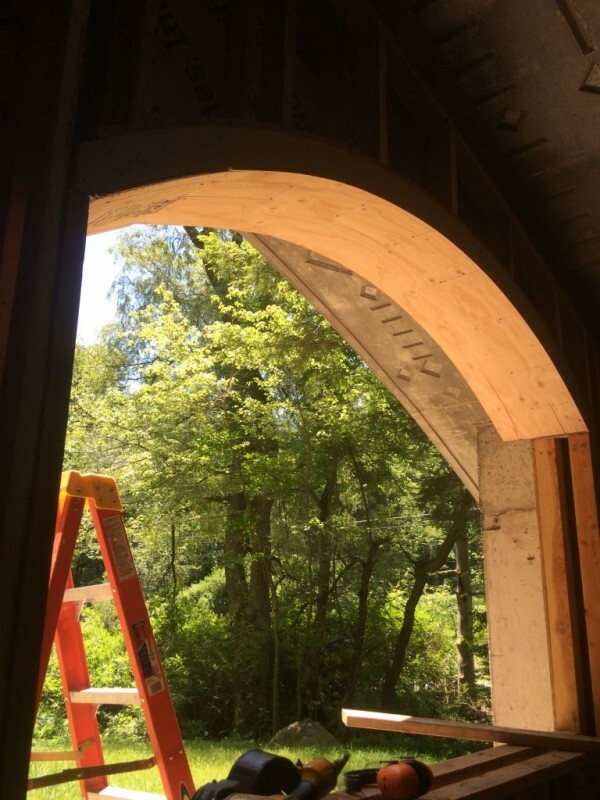 Luckily for me when I bought the 1/4 inch plywood for this arched window it started to rain. The rain soaked one side of the plywood and as it dried it warped the plywood into a curved shape. This made it easy to bend the plywood without cracking it. This worked really well on the first window. Framing extension on the first window. Nice view out of that window eh? The second window wasn’t so easy though. This sheet plywood didn’t get rained on. When I went to bend it it started to crack. So I put the plywood into the pond and let it soak for a few moments and then set up a little something to bend the curvature I needed for the window arch. check it out. Milk crate and two concrete blocks. 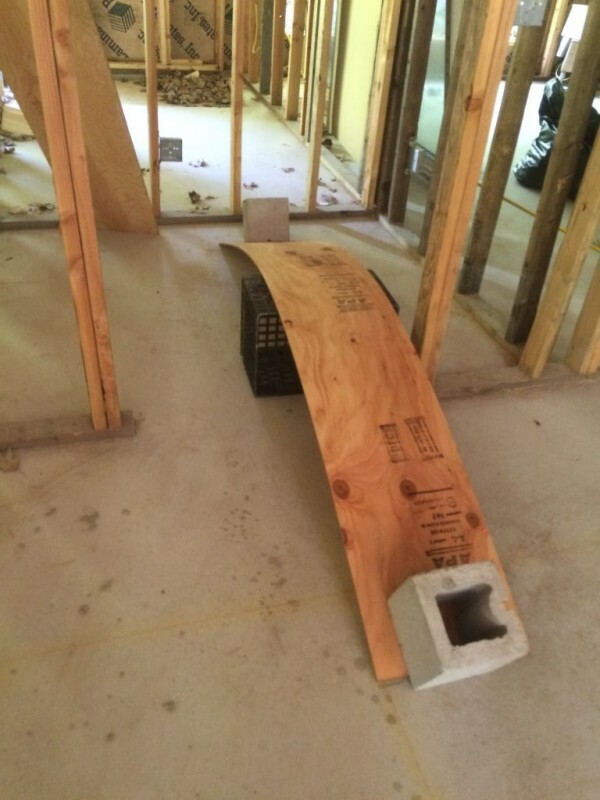 Just add water and you’ve got the curved plywood you’ve been looking for. So the other key element that has to happen for Passive house certification is complete air sealing of the house. I had Georgia start this as soon as Terence finished nailing off some of the sheathing. 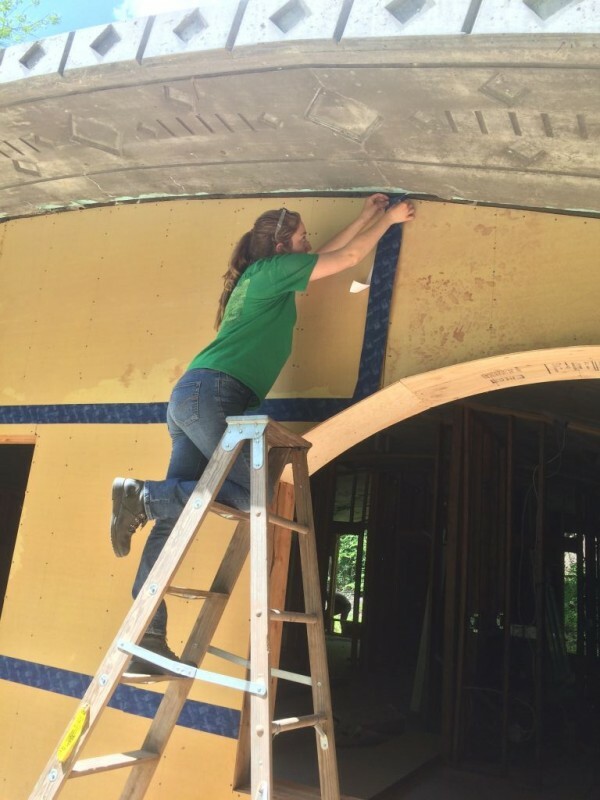 We used the Tescon Vanna tape from building supply 475. This is a vapor open tape which allows things to dry properly if moisture gets into the assembly. The stuff is supposed to last 100 years. Hmmm. We’ll see. Numenoreans were said to live up to 500 years. Hopefully I have a little bit of their blood in me. Hey, you never know.Here’s Georgia taping away. Georgia air sealing the plywood seams. The other thing I wanted to do on the air sealing front was spray foam the bottom joint at the concrete sheathing interface. I’m not sure this was necessary but I figured now would be a good time to do it before I air sealed with ice and water shield. Once this dries I’ll scrape away the excess and then use Grace ice and water shield to air seal this joint. I’m running out of time now so I’ll just show you my final shot of the window. There are a few more items we have to do before window installation but this is the general idea. We have to air seal this assembly and then we can pretty much install our first window. Hoping to do this next weekend if all goes well! I hope all you Father’s out there enjoyed Father’s Day. It was very special for me. I’ve been blessed with very wonderful children. See you all next week and thanks for stopping by! son-in-law,you sure have been blessed with great kids and the greatest mother-in-law,had the tortillas left over they were great.So whats afew tortillas between family,as long as I get more. The windows look so good it’s looking better and better.